What is the real average bull and bear market? How long is the average bull market and bear market? With the current bull market in stocks at its 54th month, I’ve been hearing several different statistics thrown around lately about the “average” length of historical bear markets. To calculate how long the average uptrend lasts, we have to decide what index represents that stock market and use its most relevant data. But also the most relevant data points: defining a bull and bear market. I was telling someone recently what I believe is the correct method to calculate the average bull market cycle. The average bull market lasts about 39 months. Someone had used the S&P 500 data from Shiller’s database which goes back to 1871 to conclude the average bull market is 50 months. I note two issues with the way the calculated their average. While that data can be useful for some purposes, we have to understand how the data was compiled and its details. For example, the S&P 500 has been widely regarded as the best gauge of the large cap U.S. equities market, but it was first published in 1957. You may wonder how the Shiller data goes back another 86 years before the index was first published. Other indexes were used and the short story is those indexes used far fewer than 500 stocks, were focused on a few industries, and monthly data wasn’t always available. You may consider if that index prior to 1957 data is actually relevant enough to understand modern bull and bear markets. If you want, you can visit the data website to fully understand how it was created. Second, like many others do, they defined bear markets as a 20% decline from a prior peak lasting at least 3 months. They defined as an advance of 50% or more from the low of a bear market over 6 months or longer. From those definitions and parameters, they conclude the average bull market is 50 months. I develop and operate quantitative systems that I apply to price data to identify potentially profitable price trends and manage risk. In other words, I prefer to have exposure to rising trends and avoid (or short) falling trends. I can tell you from my expertise that one great thing about my process is that it requires me to precisely define every single detail. That is, the data, definitions, and parameters create the decision-making algorithm – which is the process that tells me what to do next. I found a similar study by JP Morgan that states the average bull market is a whopping 68 months long going back to 1946. Again, they used S&P 500 data before it was published. The fine print at the bottom of the chart states they defined a bear market as “a peak-to-trough decline in the S&P 500 Index (price only) of 20% or more. The bull run data reflect the market expansion from the bear market low to the subsequent market peak.” That explains why their bull markets appear so long. While defining bull and bear markets with percentages is popular, it seems to leave out the reality of bull and bear market cycles: there is a full market cycle. 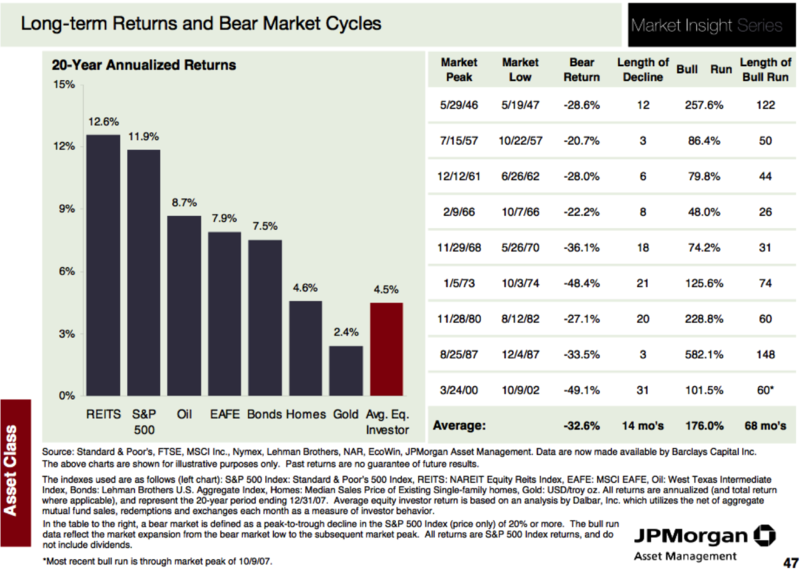 A full market cycle includes both a bull and a bear market period, together. These cycles last about 56 months and some believe it is tied to the business cycle and others believe it may be more connect to politics. A data driven researcher doesn’t need theory to explain what causes it – it is what it is. I believe the charts below by Ron Griess at TheChartStore more accurately represent the average bull market by considering the full market cycle rather than defining them by percentages. The time frame is in weeks, so it shows the average bull market cycle is 155 weeks or about 39 months. The average bear market is about 17 months, which actually matches the most recent bear market from October 2007 to March 2009 (17 months). A full market cycle is 56 months. Whatever we believe is always true for us. Whether you believe the average bull market lasts 39 months, 50 months, or 68 months, it seems the current one is likely late in its stage at 54 months as of September 2013.